Tried putting on your make up with a regular mirror? Always need a little bit of extra light and magnification? I know for me being a glasses wearer, it's a necessity! So I bought this cosmetic illuminated mirror and today I'm telling you all about it! Ok! So as you guys may have noticed, I wear glasses! And as I've started on my beauty journey (I'm learning all about make up and how to get the delicious looks I've seen online!) I learned quickly that I needed a magnifying mirror and lite up (until I can build a vanity!). So, naturally I went on Amazon and started looking! I looked at a bunch of items (not even exaggerating) and I finally found one I was ready to invest in! 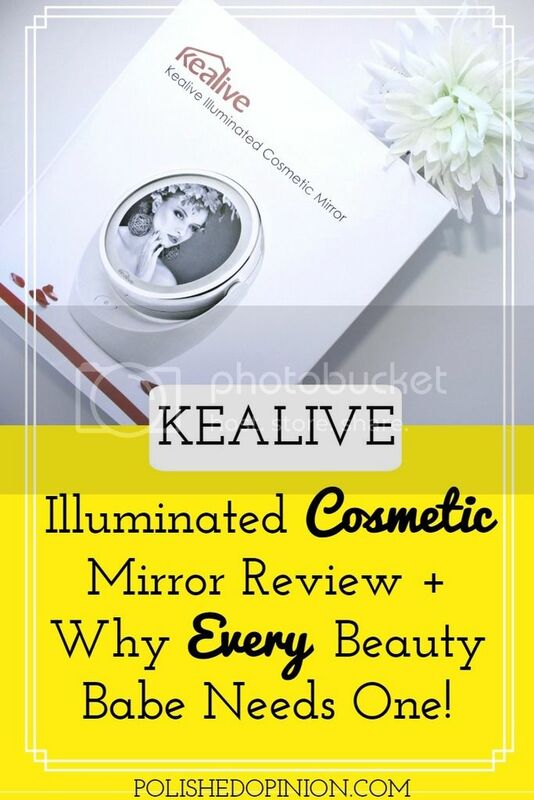 The Kealive Illuminated Cosmetic Mirror! It's helped me so much! It came super fast (I was going out that night so I ordered it as a same day delivery!) and it came with batteries!!! That was awesome! So I got right to it! I started using it and while it was a tiny bit small, it's pretty perfect to put away and on my beauty shelf I have going! It's easy to travel with! I brought it with me to the boyfriends parents house and I just popped back in a battery and it was ready to go! It was a reasonable price (yes I paid for it, it was not sent to me and this is not a sponsored post!) and it's just so darn cute! I definitely liked that there were a lot of positive reviews posted (some of those were sponsored). It's easy as popping in the battery and tapping the the power button, which is smack dab in the middle and easy to just tap and it's on! I LOVE the magnified section, so when I'm working on my eyebrows and foundation, the magnification really gets close, this is especially helpful seeing as I have to do my make up without my glasses! It's 5X magnified too! And lets talk about the light! It's a bright, light that isn't yellow! It's LED and WHITE so it's true to your face and is helpful when you're applying your foundation and concealer! I thought this was especially awesome seeing as it's only battery powered! Check it out below! I took a picture without the flash so you guys could get a real look at it light up! Why do you need one? Aside from the fabulous lighting, it's compact and easy to travel with! Let's face it, it would be a pretty handy selfie helper! Am I right! I Think I'll actually try that out actually! But for your Make up masters on the go, why not have this in your overnight bag? Can you go wrong!? Do you have a new cosmetic/beauty item that will help make life easier you'd like reviewed? Tell me about it in the comments below and I'll look into it!